The roles and responsibilities of Infrastructure & Operations (I&O) teams are ever‑changing. Gartner has identified the Top 10 Technology Trends Impacting Infrastructure & Operations for 2018. As we gear up for our annual user conference, NGINX Conf 2018, I wanted to take a look at how the NGINX Application Platform helps you keep up with each of the ten trends. Let’s break down each of Gartner’s ten trends, followed by a table that summarizes the trends and how NGINX solutions help. Outside factors including the European Union’s General Data Protection Regulation (GDPR), geo specific workloads and global and regional network access are driving IT to spend more time on geo planning as part of their longer term strategies. The NGINX Web Application Firewall (WAF) protects applications against sophisticated Layer 7 attacks. Our WAF automatically blocks traffic from known malicious IP addresses discovered anywhere across the global network. NGINX Open Source and NGINX Plus can differentiate users based on their geographical location. For example, you can have different website content for different countries, or you can restrict content distribution to a particular country or city to comply with local regulations. Edge computing solutions address th[e] need for localized computing power. . .[which is] very important in the context of Internet of Things (IoT). . . .The intelligent edge serves as the decentralized extension of the campus networks, cellular networks, data center networks or the cloud. NGINX Plus can be used as a content cache to accelerate performance of applications at the edge. For instance, when a firmware upgrade needs to be issued to devices at the edge (IoT sensors, for example), firmware can be downloaded from the cloud once to an NGINX Plus web server located at the edge, thereby vastly increasing the speed of the upgrade across all the devices at the edge. Enterprises are beginning to adopt microservices at the edge. NGINX Plus can act as reverse proxy to manage all the traffic for all your microservices at the edge. (See also Trend 5). Intent‑based networking (IBNS) is a piece of networking software that helps to plan, design and implement/operate networks that can improve network availability and agility, which becomes increasingly important as organizations transition towards digital business. NGINX Controller, which helps I&O teams manage the entire life cycle of load balancers – from initial configuration through validation to ongoing monitoring and maintenance – is our first step toward developing an intent‑based application services platform. Our vision is enable customers to specify the business outcome they want – such as “ensure website loads in three seconds or less” – and NGINX Controller automatically deploys and configures the various load balancer, API gateway, or service mesh instances to ensure that SLA is met. APIs support the creation of, and connection to, external ecosystems, marketplaces and communities. “Ensure that your organization takes an ‘API first’ approach, designing APIs based on the requirements of your organization’s ecosystem,” says David Cappuccio, vice president and distinguished analyst at Gartner. An API gateway is a critical component of your digital platform when you take an API‑first approach: it enables you to define, maintain, and secure your APIs at scale. NGINX Plus can be used as an API gateway solution. NGINX Plus offers robust functionality such as request routing, rate limiting, and API authentication. It’s often part of a broader API management solution that provides developer self‑service, metering, monitoring, and other API‑specific workflows. Digital experience management (DEM) is the impact of presenting the right digital experience to customers. The experience could be mobile or web‑based, and should be always available, continually improving and perform quickly and consistently. Providing an exceptional digital experience is a crucial element of an enterprise’s digital transformation strategy. Increasingly, enterprises are using modern application stacks and architectural patterns such as microservices to achieve this goal. A simplified web stack designed for digital experience delivery that is both a web and application server and supports multiple languages helps you to accelerate your path to microservices. NGINX Unit fills the bill as an open source dynamic web and application server. NGINX Unit works with NGINX Plus to provide a lightweight stack designed to deliver the right experience to the right user with the right performance and security level. Business units are demanding agility, in opening new markets, taking on emerging competitors, bringing in new suppliers, and creating innovative ways of interacting with customers. NGINX Plus helps you achieve agility as its the only integrated platform to be a load balancer, API gateway, content cache, and web and application server. NGINX Plus is designed to fit seamlessly into CI/CD and other DevOps workflows such as A/B testing and blue‑green deployments, making your infrastructure as agile as your developers. You can eliminate time‑consuming and cumbersome deployment and configuration management processes associated with hardware‑centric load balancing solutions by automating these activities with tools such as Ansible, Chef, and Puppet. NGINX Plus, being a multi‑purpose, software‑based traffic management solution, enables self‑service access to infrastructure, unlike hardware‑based application delivery systems which reinforce a ticket‑based approach to infrastructure delivery. All these capabilities help I&O and DevOps teams to realize greater deployment and feature velocity and frees up time to go beyond traditional IT. NGINX prodcuts are specifically designed to run in an “as‑a‑service” model. Whether on‑premises or in a public cloud, NGINX Open Source is a proven technology that powers many of the native load‑balancing solutions in public clouds. According to the State of Modern Applications in the Cloud, a report from log management and analytics provider Sumo Logic, it’s also the leading web server running on AWS. Given its portability across clouds (see Trend 8), it allows you to deliver all your services in a cost‑effective manner (see Trend 9) from any provider that you choose, without compromising on performance, reliability, or security. For many enterprises the journey to the cloud is a slow, controlled process. Colocation and hosting providers have established private or shared clouds on their premises to provide customers some basic cloud services, enabling controlled migrations, staff skills training and a “safe” cloud environment as a stepping stone to increased cloud adoption in the future. NGINX solutions assist you with taking a cautious approach to cloud adoption. They are flexible and portable – both NGINX Plus and NGINX Controller can be deployed anywhere: public cloud, private cloud, bare metal, virtual machines, and containers. NGINX’s multi‑cloud versatility frees you from lock‑in with any cloud vendor. It also enables you to reduce complexity, achieve stability, and avoid any nasty surprises when running your applications in hybrid environments (on‑premises and public cloud) or multi‑cloud environments (multiple private or public clouds). Bottom line, NGINX products ensure your application architecture is independent of the delivery platform. As a result, you can migrate applications from on‑premises to (or across) the public clouds of your choice at the pace that makes the most sense. Whether you are adopting a lift‑and‑shift approach or building cloud‑native applications from scratch, you’ll have a consistent, abstracted application delivery infrastructure spanning clouds. You can achieve reliable performance and stability as well as save time during setup, configuration, and troubleshooting by using the same load balancer, web server, and application server in any environment. Organizations need to focus on optimizing capacity and guard against stranded capacity – things that are paid for, but not really being used. Organizations must learn to focus not just on uptime and availability, but also on capacity, utilization and density. The NGINX Application Platform is a software‑only solution designed to collapse multiple, disparate hardware solutions into a single platform. This ensures you only deploy and pay for the capacity you need across a range of infrastructure services. Take for example, load balancing. According to a survey we conducted with O’Reilly Media, 50% of respondents were unaware of their hardware load balancer spend and 90% of enterprises only use basic load balancing despite paying for advanced features. As a software‑based load balancer, web server, and application server, NGINX Plus is significantly more cost effective than hardware‑centric load balancers. You can achieve dramatic reduction in costs without sacrificing functionality or performance – up to 87%. The data center as the sole source of IT infrastructure has given way to a hybrid of on‑premises, colocation, hosting, and public and private cloud solutions. These elements are being combined with a focus on providing business‑enabling services and outcomes, rather than a focus on physical infrastructure. Enterprises must apply a future‑looking, enterprise‑wide “steady hand” to IT strategy and planning, and apply appropriate guardrails, or face the possibility of losing relevance, governance and enterprise agility. The flexibility and portability of NGINX solutions help you achieve your business objectives wherever your infrastructure is hosted. NGINX Controller serves as the orchestration plane that manages your data plane and ensures efficient application delivery across a multi‑ or hybrid cloud environment. NGINX products also have an extensive set of APIs that allows for seamless integration with other infrastructure management and monitoring tools such as Ansible, Chef, Puppet, DataDog, New Relic, and ServiceNow for effortless management of your entire infrastructure ecosystem using the tool of your choice. The NGINX Application Platform is a modern, lightweight infrastructure solution for developing and delivering applications. It’s designed to help I&O organizations modernize – by embracing cloud and DevOps practices, connecting edge compute, delivering compelling digital experiences, and managing infrastructure by specifying business outcomes that need to be achieved. Which trends are most relevant for your organization? Let us know in the comments below. In the meantime, get started with an NGINX Plus or NGINX Controller trial and learn how we can help you succeed with your infrastructure modernization efforts. Outside factors including the European Union’s General Data Protection Regulation (GDPR), geo specific workloads and global and regional network access are driving IT to spend more time on geo planning as part of their longer term strategies. The NGINX WAF automatically blocks traffic from known malicious IP addresses discovered anywhere across the global network. NGINX Plus also enables different website content for different countries, or restricting content distribution to a particular country or city to comply with local regulations. Edge computing solutions address th[e] need for localized computing power. . .[which is] very important in the context of Internet of Things (IoT). . . .The intelligent edge serves as the decentralized extension of the campus networks, cellular networks, data center networks or the cloud. NGINX Plus can be used as a content cache to accelerate performance of applications at the edge. For instance, when a firmware upgrade needs to be issued to devices at the edge (IoT sensors, for example), firmware can be downloaded from the cloud once to an NGINX Plus web server located at the edge. NGINX Plus can act as reverse proxy to manage all the traffic for all your microservices at the edge. IBNS is a piece of networking software that helps to plan, design and implement/operate networks that can improve network availability and agility, which becomes increasingly important as organizations transition towards digital business. NGINX Controller, which helps I&O teams manage the entire life cycle of load balancers – from initial configuration, to validation, to ongoing monitoring and maintenance – is our first step toward developing an intent‑based application services platform. Our vision is enable users to provide a desired business outcome as input which would be used by NGINX Controller to automatically deploy and configure the various load balancer, API gateway, or service mesh instances to ensure SLA is met to achieve that outcome. “Ensure that your organization takes an ‘API first’ approach, designing APIs based on the requirements of your organization’s ecosystem,” says David Cappuccio, vice president and distinguished analyst at Gartner. With an API‑first approach, you need an API gateway that helps you to define, maintain, and secure your APIs at scale. This is a critical component of enabling your digital platform. NGINX Plus can be used as an API gateway solution. NGINX Plus offers robust functionality such as request routing, rate limiting, and API authentication. NGINX Plus is often part of a broader API management solution that provides developer self‑service, metering, monitoring, and other API‑specific workflows. Digital experience management (DEM) is the impact of presenting the right digital experience to customers. The experience could be mobile or web‑based, and should be always available, continually improving and perform quickly and consistently. Enterprises are increasingly using modern application stacks and architectural patterns such as microservices to provide an exceptional digital experience. NGINX Unit, an open source dynamic web and application server, combined with NGINX Plus helps you accelerate your path toward microservices, as they provides a lightweight web stack designed to deliver the right experience to the right user at the right performance and security level. Business units are demanding agility, in opening new markets, taking on emerging competitors, bringing in new suppliers, and creating innovative ways of interacting with customers. NGINX Plus helps you achieve agility as its the only integrated platform to be a load balancer, API gateway, content cache, and web and application server. It is designed to fit seamlessly into DevOps workflows such as A/B testing and blue‑green deployments. You can easily automate deployment and configuration activities using tools such as Ansible, Chef, and Puppet and realize higher deployment and feature velocity which frees up time to go beyond traditional IT. “Making key short‑term decisions can lead to a long‑term strategy that incorporates the best of ‘as a service’ and the cloud without compromising IT’s overall goals to both protect and enable the business,” says Cappuccio. “In this manner, IT can enable the use of cloud services across the business, but with a focus on picking the right service, at the right time, from the right provider, and in such a way that underlying IT service and support does not get compromised.” NGINX products are specifically designed to run in an “as‑a‑service” model. Whether on‑premises or in a public cloud, NGINX Open Source is a proven technology that powers many of the native load‑balancing solutions found in public cloud providers. It’s also the leading web server running in AWS. Given its portability across clouds (see Trend 8), it allows you to deliver all your services in a cost‑effective manner (see Trend 9) from any provider that you choose without compromising on performance, reliability, or security. 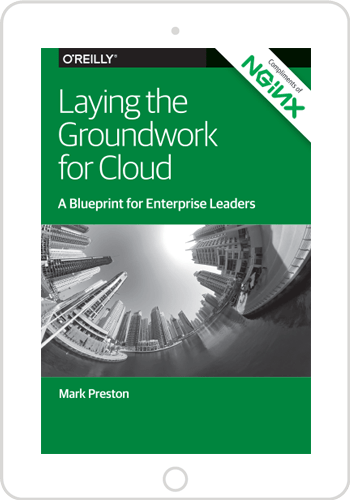 For many enterprises the journey to the cloud is a slow, controlled process. Colocation and hosting providers have established private or shared clouds on their premises to provide customers some basic cloud services, enabling controlled migrations, staff skills training and a “safe” cloud environment as a stepping stone to increased cloud adoption in the future. NGINX solutions are flexible and portable – both NGINX Plus and NGINX Controller can be deployed anywhere: public cloud, private cloud, bare metal, virtual machines, and containers. NGINX’s multi‑cloud versatility gives you freedom from lock‑in with any cloud vendor. It enables you to reduce complexity, achieve stability, and avoid any nasty surprises in any environment. You can migrate applications from on‑premises to (or across) the public clouds of your choice at the pace that makes the most sense. Organizations need to focus on optimizing capacity and guard against stranded capacity – things that are paid for, but not really being used. Organizations must learn to focus not just on uptime and availability, but also on capacity, utilization and density. Typically, most hardware resources are over‑provisioned including load balancers. The NGINX Application Platform is a software‑only solution designed to collapse multiple, disparate hardware solutions into a single platform. This ensures you only deploy and pay for the capacity you need. Take for example, load balancing – NGINX Plus being a software based load balancer, web, and application server is significantly more cost effective than hardware‑centric load balancers. You can achieve dramatic reduction in costs without sacrificing functionality or performance – up to 87%. The data center as the sole source of IT infrastructure has given way to a hybrid of on‑premises, colocation, hosting, and public and private cloud solutions. These elements are being combined with a focus on providing business‑enabling services and outcomes, rather than a focus on physical infrastructure. Enterprises must apply a future‑looking, enterprise‑wide “steady hand” to IT strategy and planning, and apply appropriate guardrails, or face the possibility of losing relevance, governance and enterprise agility. Flexibility and portability of NGINX solutions help you achieve your business objectives wherever your infrastructure is hosted. NGINX Controller serves as the orchestration plane that manages your data plane and ensures application delivery across a multi or hybrid cloud environment. NGINX products also have an extensive set of APIs that allows for seamless integration with other infrastructure management and monitoring tools such as Ansible, Chef, Puppet, DataDog and NewRelic for effortless management of your entire infrastructure ecosystem using the tool of your choice. Try out the NGINX Application Platform for yourself – start a 30‑day free trial of NGINX Plus and NGINX Controller today.